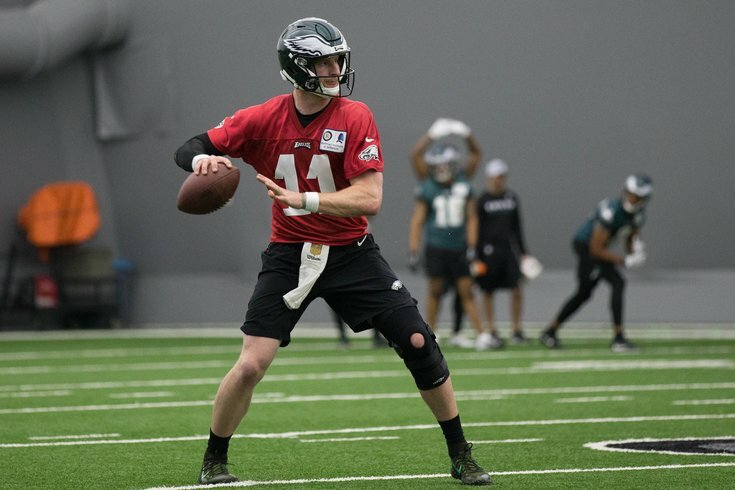 The Philadelphia Eagles have now had two OTA practices in front of the media, giving us our first glimpses of Carson Wentz's progress in his recovery from surgery to repair a torn ACL and LCL in his left knee. Wentz was the focus of our practice notes from the first day of OTAs, as he participated in individual drills. With the disclaimer that I'm not a doctor, he appeared further along in his recovery than expected. Dr. David Chao, who has a good track record of analyzing video and opining on players' injuries from afar, wrote that Wentz looks good, but that the injury is far from behind him. As you'll see in the video below, he's careful about putting weight on his front foot when delivering the football. Even with a gimpy knee, Wentz still has plenty of velocity. The following is video that I have shot of Wentz over the first two OTA practices, which we'll update on occasion to show his progress.